A basic hand-launched glider can be patterned after almost any real aircraft. These fly great. Heave ho! Trim model for left turn in glide if you launch right-handed. Then model makes a curling climb and arrives at maximum altitude with wings level and at glide speed. Setting dihedral joints is merely a matter of having enough small dope bottles. Models use same wings but Bonanza's tail is slightly longer. Color with Magic-Marker. LIKE TO BUILD a flying model that's simple, quick, and fairly realistic? Here it is! 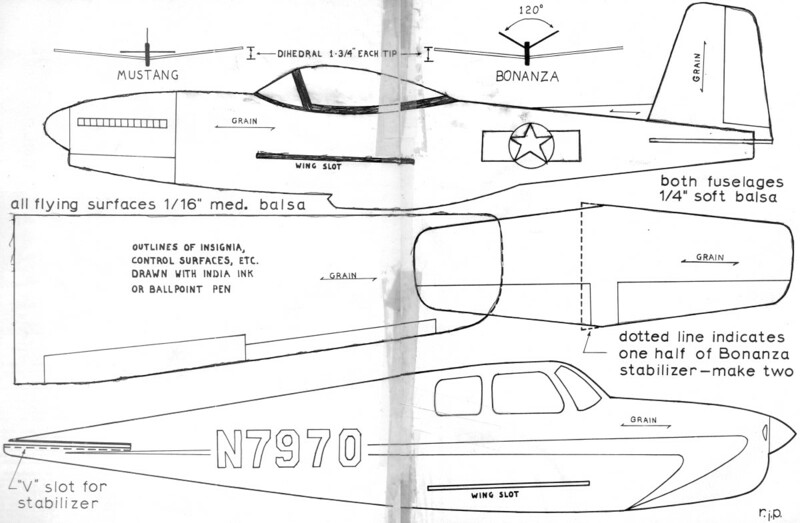 Choose either of two well-known aircraft-the Mustang or the Beech Bonanza-and build the plane directly from the full-size plans. Or, better yet, build both at once for a real ball! A single sheet of 1/4 x 3 x 36" will build three fuselages, and two pieces of 1/16 x 3 x 36" will easily build all of the flying surfaces for two to three models. 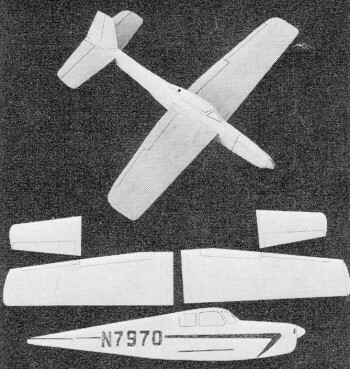 By building two or more planes at once, airplanes can be turned out in less time than by building them singly, especially if they are the same or nearly the same in design. This is a trick the experts use in building their stables of high-performance contest jobs. In performance as well as appearance, both planes are a cut above most of the chuck gliders that can be bought in the stores. The Mustang flew out of sight in a big, lazy thermal the third time I had it out-good thing I got pictures first! There are a number of ways to build from full-size plans. 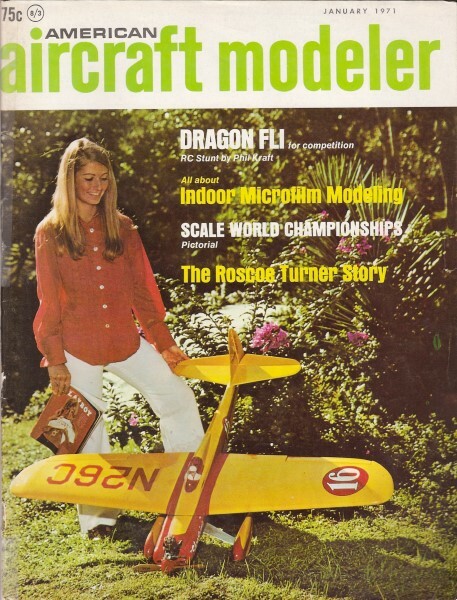 The easiest is to cut out the magazine pages, tape them together, and use carbon paper to trace the parts onto balsa. However, once this is done the plan is as good as lost, and the book is pretty well ruined. Most modelers like to keep their books intact, both for reference and for nostalgia. My own collection dates back into the early 1950's, and I often turn to it for design ideas and performance tips. Aerodynamic theory doesn't change much, so books don't really get out of date. It's best, then, to avoid mutilating the I book. Instead, either trace the part outlines directly onto thin paper, using carbon paper, or run the page through a Xerox machine available at most libraries or schools. This last method is not against the law as long as the plans are for personal use only. Be sure to ask for legal size, and the whole plan should come out in a single printing. To trace the parts from the copy of the plan, use carbon paper or the pin­prick method - aligning the plan over the wood and punching shallow pinholes every 1/4" or so all around the outlines of the parts. Notice the grain direction of all of the parts, because it's very important. Learning to use wood grains to their best advantage for strength and warp-resistance is one of a modeler's most valuable skills. Use the softest wood available for the fuselage. If no really soft 1/4" is in the balsa rack, drop down to 3/16" and pick a piece of medium softness. The harder the wood, the heavier it will be, and neither model can stand a great deal of extra weight if it is to fly well. The only difficult cuts on the fuselage are the wing and stabilizer slots. They must be marked accurately. A modeler's knife with a triangular blade helps in the cutting. The cut can be made with a single-edge razor, but the slots must go through the fuselage exactly on the perpendicular. Otherwise either the wing or the stabilizer will have a high side and a low side. These perpendicu­lar cuts are much easier to make with a long-handled knife than with a razor blade. When using a razor, prop it against a scrap piece of 1/4" balsa (one with a square edge) to guide it into the wood straight. Cut the wing and tail out of medium­weight, straight-grained balsa. Don't be backward about asking the hobby dealer to help in selecting this piece of wood. Tell him what it's for, and ask if he has C-grain balsa. C-grain indicates the way the balsa was sawed out of the log; it is particularly good for strong, light sheet surfaces. What about airfoils? Most models this size have some sort of curve to their wing cross-section, whether it's a scientifically plotted shape or simply a warp made by spraying the top side of the wing with water and pinning it to a flat surface until dry. 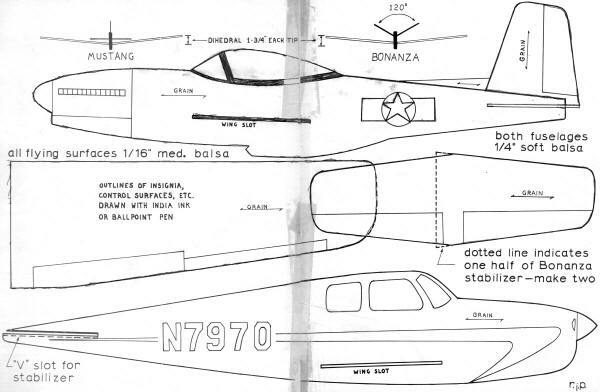 The plans show no airfoils, just a flat plate, and that's what the planes pictured have. I tried airfoiling the wings, but it didn't increase. the performance much. 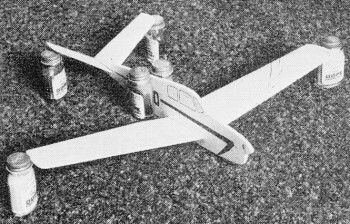 However, later models were built with 3/16" wood for the wings and a conventional airfoil sanded into them. (Both the wood and the instructions in Jetco Thermic B hand-launch kits are ideal for this purpose.) This increases the performance of both gliders amazingly, and makes them almost contest quality. Try it on your second or third model and see! Flying is simple. Add nose weight until the plane balances about 1" back from the front of the wing. A coin glued onto the side of the fuselage as far forward as possible makes a fine weight. 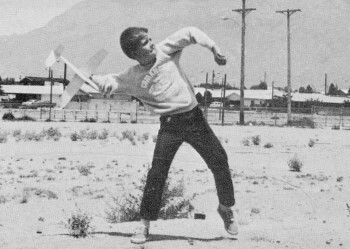 Throw the plane gently, aiming it at the ground about 30 ft. in front of you, and observe the turn. If you are right-handed, the plane should turn left; opposite for lefties. Now tightly grip the fuselage, under the wing, between thumb and third finger, putting the tips of the first and second fingers behind the wing trailing edge and snug against both sides of the fuselage. Throw the plane sidearm, so that it starts out in a right bank and circles. If you have the proper amount of left turn in the glide,. it should "s-out" into a left turn at the very top of the throw. Experiment with the direction of throw in relation to the wind to find the best altitude. Generally it will be just slightly to the left of the wind, but the choice of direction depends on the individual. Good flying!